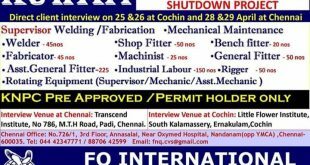 Urgently needed for zamil offshore for ongoing ship repair and ship building project Huge recruitment client walkin interview contact details given .Apply soon. Zamil Offshore Services was founded in 1977 as a 100% Saudi Company working in diversified business fields. It is the largest offshore & marine services provider in the Middle East. Its scope of work covers; offshore marine services, ship chandelling, ship chartering, offshore hook-up projects, offshore shipbuilding, ship & rig repair and sea ports operation and management. ALL CANDIDATES SHOULD HAVE MIN. 05 YRS. OF EXP. 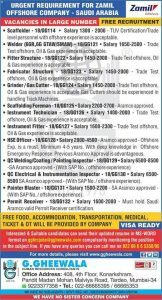 Hvac supervisor required please call me phone number is 00968 99289729 , i am working in oman in “ONEIC SAOG COMPANY , 17 years experience in this field. 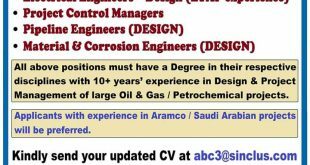 i am chief engineer.if vacancy will come.Please let me know.i have all type of vessels experience.